A map showing the areas the warning is in place. Be cautious if you are planning on spending time in the backcountry this weekend. 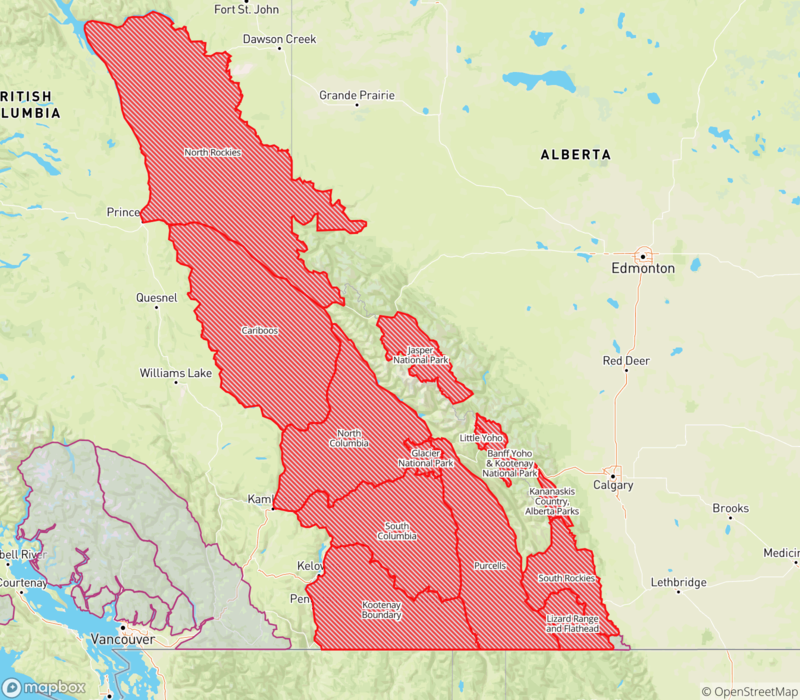 Avalanche Canada has issued a Special Public Avalanche Warning for the Lizard Range & Flathead, South Rockies, Purcells, Kootenay Boundary, South & North Columbia, Cariboos, and North Rockies. Sun Peaks falls within the warning area. For a map of the regions involved, click here. The release said many surprises or near misses have taken place in recent weeks and a fatal accident occured between Valemount and Blue River on January 30. Parks Canada and Kananaskis Country have also released special public avalanche warnings for the weekend. Click here to learn more. For current avalanche conditions, visit www.avalanche.ca.